The North American Refugee Health Conference 2018, the largest refugee health conference of its kind, was held this June in Portland, Oregon. 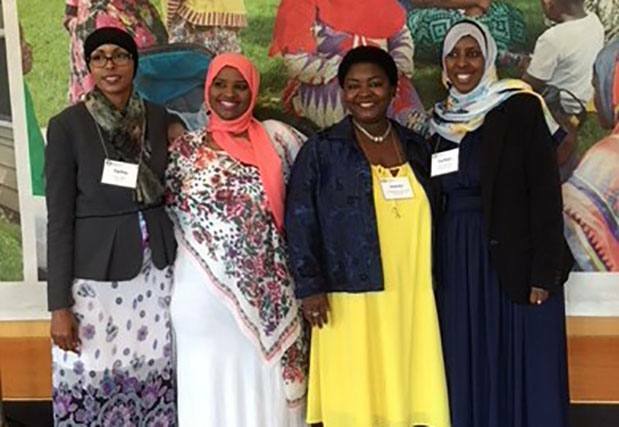 Farhia Omar (pictured far left), Senior Research Coordinator in Arizona, represented Mayo Clinic’s Office of Health Disparities Research at this three day conference designed for those at the frontline in addressing refugee health needs. This Conference welcomed 700 participants and consisted of 6 keynotes, 11 plenary sessions, 32 workshops and 81 scientific abstract oral presentations and over 100 scientific posters. This one of a kind event provided participants with access to the most recent research, best practices in refugee health as well as a great opportunity for networking. The target audience included: Allied Health Workers, Dentists, Family Physicians, Mental Health Workers, Nurse Practitioners, Nurses, Policy and Public Health Specialists, Primary Care Practi-tioners, Refugees, Specialists, settlement workers or other professionals interested in refugee health. The conference takes place in June each year and alternates between the United States and Canada.